The Kepler Sensor accurately measures foot traffic using wireless phone detection technology. Our engineers designed and built the Sensor here in Australia. 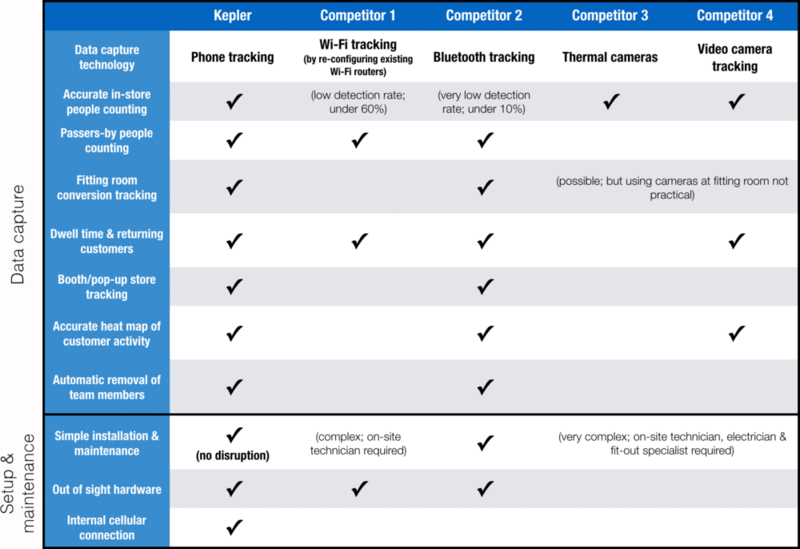 How does the Kepler Sensor Compare to other technologies on the market? Our engineering team has rigorously tested more than 60 existing solutions in the market for in-store people detection. None are sufficiently powerful and practical enough to implement globally. Forecast which stores won't achieve targets in real-time and fix the lagging metrics before the day ends. Data can be overwhelming. Our guiding principle is to provide you with real impact and we help you prioritise data driven opportunities based on the realities of your business. We have invested heavily into advanced systems and processes that monitor and protect the security, integrity and reliability of your data.